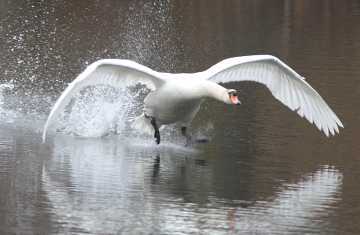 A mute swan makes a running start across the water to take off into the air. Mute swans are one of heaviest flying birds in the world. Adults weigh about 25 pounds, stand 4 to 5 feet high, and have a wing span of 6 to 8 feet. This season is full of changes in the natural world, but for a while longer at least, swans will grace some of Westborough's ponds. Our local swans are mute swans (Cygnus olor), recognizable by their bright orange beaks with a black knob at the base and by the graceful curve of their necks when they swim. You can usually spot them on Mill Pond during most of the year, or perhaps on Hoccomocco Pond or Lake Chauncy. They don't migrate, and they tend to stay in town until our ponds freeze over. When ice prevents them from getting at the underwater vegetation that they eat, the swans simply move to open water elsewhere. They typically spend the winter on sheltered coastal bays and salt marshes. Mute swans are not native to North America. They originated in Europe and Asia, where they have a long history. They were kept for food in Britain until about a century ago and were hunted there. They were known as "royal birds," but not because of their stately bearing. All swans were the Crown's property unless they had been marked (with nicks on their beaks or the webs of their feet) to show that someone owned them. Mute swans are the national bird of Denmark. They star as the "ugly duckling" who turns out to be a beautiful swan in the story of that name by Danish storyteller Hans Christian Andersen. The mute swans in Massachusetts are newcomers. They descended from a few pairs that were introduced in New York in the mid-1800s on ponds on estates in the Hudson Valley. Some of these imported swans became wild and mutiplied, starting populations that have been spreading into New England and other east coast states. Are mute swans really mute, as their name suggests? They are usually silent, but they can hiss, grunt, and make soft barking noises. These sounds are typically part of a display of threatening behavior. Mute swans don't sing a beautiful "swan song" before their death, as legend would have it. Mute swans make a tranquil scene as they float on a lake, but they can be aggressive, especially during the breeding season. Pairs defend territories of 4 to 10 acres. They'll fight with their powerful wings and beaks to keep other water birds, and animals – and even people – away from their nest and their young. 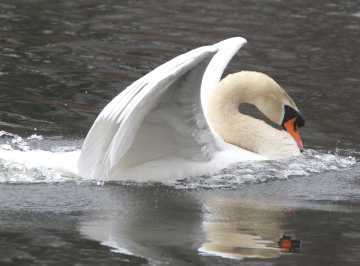 A mute swan swims in an aggressive posture, with its head down, its neck puffed up, and its wings arched over its back. In this position the swan looks bigger and more threatening to potential adversaries. It might be hard to imagine swans actually threatening a person, but just ask Don Burn, a Westborough Community Land Trust director and the prime mover in the creation of the Charm Bracelet trail system. He tells of coming upon three swans, hissing and snapping their beaks and blocking his way along the John Malley Trail near the shore of Mill Pond. Don knew better than to approach them, but he eventually persuaded them to retreat by yelling and banging a stick on a tree. Most of us will never have such a close encounter with swans, and we probably won't hear our local swans hiss and snap their beaks. But we might hear the sound of their wing beats carrying across the water – a whooshing or soft thudding sound. Mute swans do fly. Watching from shore, you might see them flying from one part of Mill Pond to another. Mute swans are among the heaviest flying birds in the world. They need a running start across the water to become airborne, but they can fly long distances at 40 miles per hour or more. Learning to fly can be tricky for any young bird, but it seems especially harzardous for young swans. If you've seen swans taking off or landing, it's not hard to imagine why. Some juvenals die of broken necks in flying accidents. If you've noticed gray-brown swans on Mill Pond, you've seen young swans. They are harder to spot against the water than the white adults. Newly hatched swans swim right away but sometimes ride on their parents' backs. Like other young birds, they grow quickly to adult size. Young swans begin to fly at 3 or 4 months. The parents usually drive away their young before the next breeding season, sometimes when they begin to whiten. Our local mute swans usually return to nest on Westborough's ponds as soon as the ice begins to disappear in late winter. As early as February or March, you might see a pair on Mill Pond, sometimes sitting on the ice. Mute swans pair up for the long term, perhaps even for life. They make large nests of aquatic vegetation in marshy areas near shore, and both parents tend and fiercely defend their eggs and young. Lovely as they are, mute swans are controversial due to their fierceness and their appetite. They're not native, and few predators succeed in taking the aggressive adults. Wildlife experts are concerned that mute swans will push out native waterfowl, such as ducks, as they spread into prime breeding areas and compete with native wildlife for food and territory. Another concern is that mute swans might eliminate native water plants. Adults eat 8 to 10 pounds of vegetation a day, and they pull up plants by their roots for their young. Wildlife experts recommend further study to see what effects mute swans have on wetlands, but they warn that swans may need to be controlled as their numbers increase.